NEW ORLEANS — Performing with music legends Harry Connick, Junior and Branford Marsalis was unforgettable for two young musicians. Two years after opening, the Ellis Marsalis Center in the Habitat For Humanity Musicians Village is providing music education to 200 students, ages 7 to 18. “The idea that you have 7- and 8-year-old kids playing clarinet and playing violin and playing piano and playing in orchestras,” added Branford Marsalis. “I think it is kind of beyond people’s expectations, at least that’s the way parents communicate to me,” said Ellis Marsalis Center Executive Director Michele Jean-Pierre. Connick and Branford Marsalis remain committed to New Orleans. They’re also looking at the future, especially where music is concerned. Among other, sometimes less flattering designations, Bob French was considered the unofficial mayor of the Musicians’ Village. In November, he also became the first of its residents to die. On the evening of Tuesday, Dec. 4, Harry Connick Jr., Branford Marsalis and their manager, Ann Marie Wilkins, the trio who championed the construction of the Musicians’ Village after Hurricane Katrina, hosted a private memorial concert for French, the longtime leader and drummer of the Original Tuxedo Jazz Band and an especially colorful WWOZ-FM deejay. New Orleans Jazz: Charles Betts on the addictive music of Harry Connick, Jr.
New Orleans music is an addiction. Its diversity portrays every emotional state and as the legendary jazz musician Ellis Marsalis puts it, at a time when individualism is becoming an endangered species, the sounds of the Bayou represent a celebration of the individual. Put simply, without it life would be emptier. Harry Connick Jr. is arguably the city’s most famous living export, having obtained more number-one albums than any other artist in US jazz chart history. He has taken his native music across the globe, to the delight of audiences that stamp and cheer to the joyful noise. He has re-created the next-best thing to Mardi Gras at venues including the Royal Albert Hall in London, the Salle Pleyel in Paris, and on Broadway in New York. Affable humility radiates from Music Redeems, a live recording of the Marsalis family’s performance at the JFK Center in D.C. The whole prodigious clan was there: brothers Wynton, Branford, Delfeayo, and Jason on trumpet, sax, trombone, and drums respectively; patriarch Ellis on piano; and Ellis III doing spoken word. Harry Connick Jr., a long-time family friend, also made an appearance. In case you missed it, the video of Harry Connick, Jr. and Ellis Marsalis discussing the Ellis Marsalis Center for Music in the Musicians’ Village of New Orleans with Anderson Cooper on AC360 last night is now available to be viewed online. Musicians Ellis Marsalis and Harry Connick Jr. joined Mayor Mitch Landrieu on Thursday for a topping-off ceremony for the new Ellis Marsalis Center for Music in the Musicians Village. Completion of the center is expected next year. It will serve as a center for the education and development of musicians. The 17,800-square-foot Ellis Marsalis Center for Music will have three sections: a performance hall, offices, and a community room. All 72 single-family homes and five duplexes in Musicians Village were constructed by New Orleans Area Habitat for Humanity staff and volunteers. The village stands on the site of Kohn Junior High School, which was torn down in the 1990s. As we approach the fifth anniversary of Hurricane Katrina, many are taking a moment to reflect on the trials and tribulations of the people of New Orleans and to speak of the challenges they have faced and the victories hard won, their courage and the commitment to a revitalized and renewed Crescent City. We thank you all for your support these past 5 years. We are so excited about what we have been able to accomplish with your help. Yesterday, we released The Marsalis Family’s brand new album Music Redeems. 100% of proceeds from the sale of this album go to programming at the Ellis Marsalis Center for Music; the heart the of NOLA Musicians’ Village. 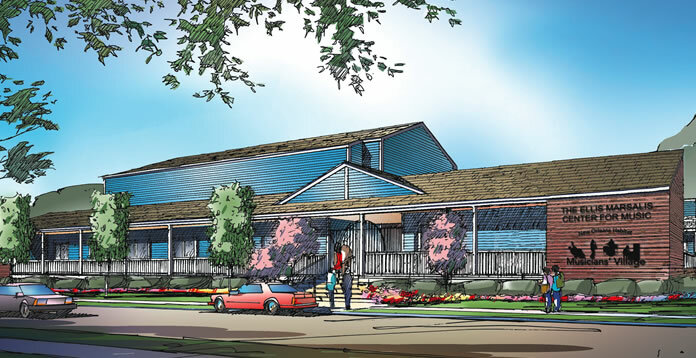 For more information on the village, please visit the official website at NOLAMusiciansVillage.org. We thank you for your support. Branford To Be Featured on CNN's "Impact Your World" Series! We are thrilled to announce that Branford Marsalis will be featured on CNN’s Impact Your World series discussing his involvement with the New Orleans’ Musicians’ Village and the future Ellis Marsalis Center for Music. Tune in during the following times, or look for his segment online later this afternoon (Friday, August 20, 2010). On CNN: Saturday 4 PM & 7 PM, Sunday 6 AM, Monday 7 AM, Tuesday 4 PM, Wednesday 2 PM, Thursday 11 AM, Friday 9 AM & 10 AM. UPDATE: We are excited to announce that Branford’s segment on CNN’s “Impact Your World” series is now online for your viewing pleasure! Please CLICK HERE to watch the video. Thank you for the support.